What are workflows? 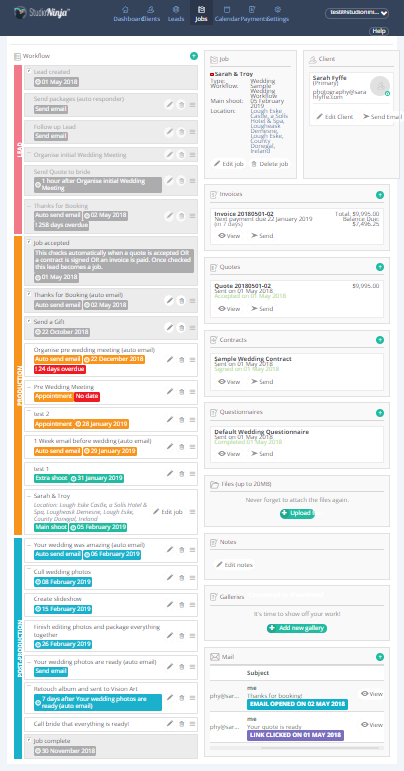 Think of a workflow as a task list that you apply to every job that you create. As your job progresses, you simply tick off tasks in your workflow and make sure nothing is forgotten. 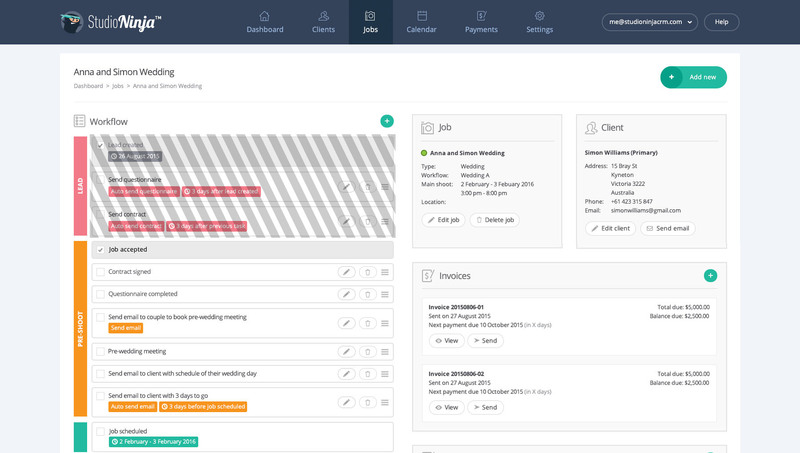 Lead created - This task will automatically become ticked as soon as you create a new lead or job, and if a lead submits an enquiry. if you create a new job. and, if you manually tick this task in the workflow. Main shoot - This task will automatically become ticked on the day that the job is scheduled. It basically means the shoot has finished. 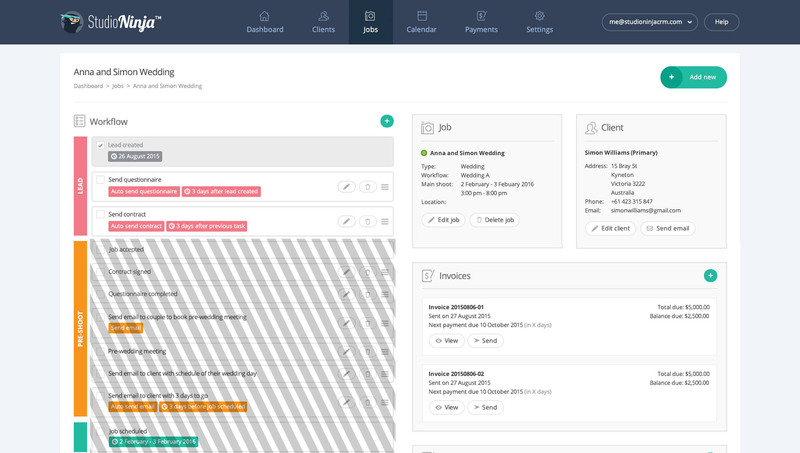 Job complete - You need to manually tick this task once everything is done and the job is finished. What does a workflow look like? Above you can see what the workflow looks like in settings and below you can see the workflow once it is assigned to a job. Below is an example of a basic workflow. 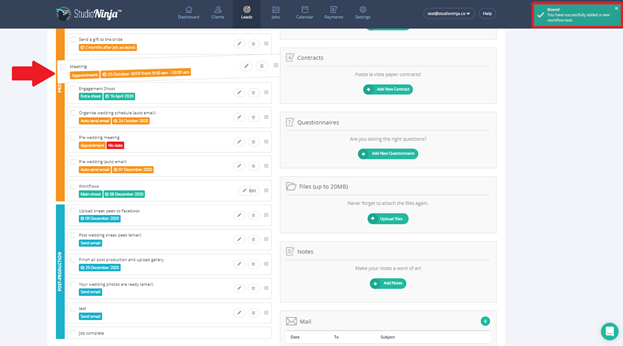 This workflow includes a variety of different tasks including to-do's, auto emails and auto questionnaires that send on due dates. 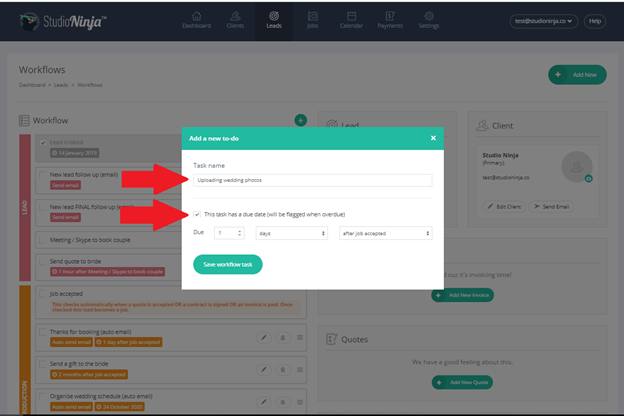 We’ve added two sample workflows on your account as a guide. 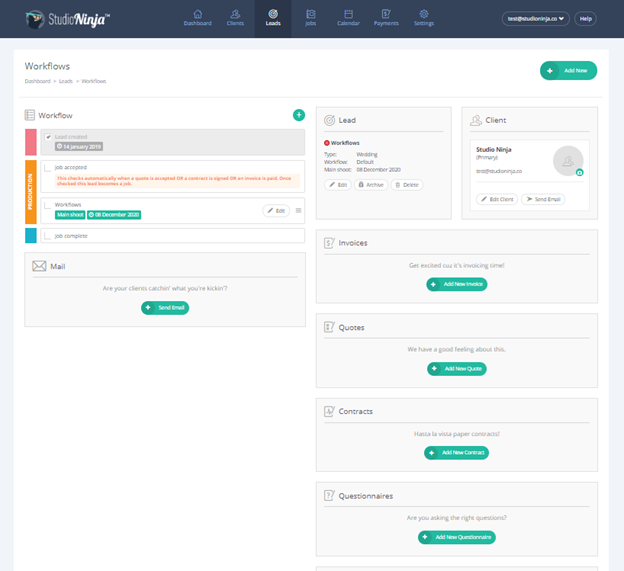 To help you manage your leads better, we designed the system to ensure that while your job is in ‘LEAD’ stage no tasks or automation will occur after lead stage. At the same time, once your job enters ‘PRODUCTION’ stage, all remaining tasks and automations from the lead stage will no longer occur. A to-do task: is basically a task that needs to be ticked off when it is completed. For example "Upload photos after wedding". So once you have uploaded your photos, you can tick this task off as complete. 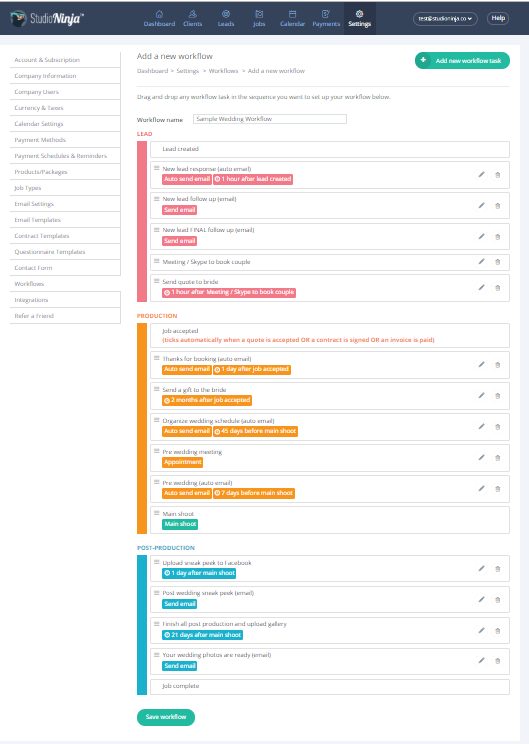 An automation task: these tasks allow you to either send an email automatically, send a contract automatically or send a questionnaire automatically. For example you might want to automatically send your couple an email 6 weeks before the wedding saying "It's time to book your pre-wedding meeting" and the system will automatically send this email to your client for you. *Note: If you don't set a due date, the auto-email will not send out. You'd have to manually tick the task to send the email out. An extra shoot: is a task to schedule an additional shoot in your workflow that appears in your calendar. For example if your client wants to have a rehearsal or an engagement shoot before the wedding (Main shoot date) then you can add this task instead of creating a new job. 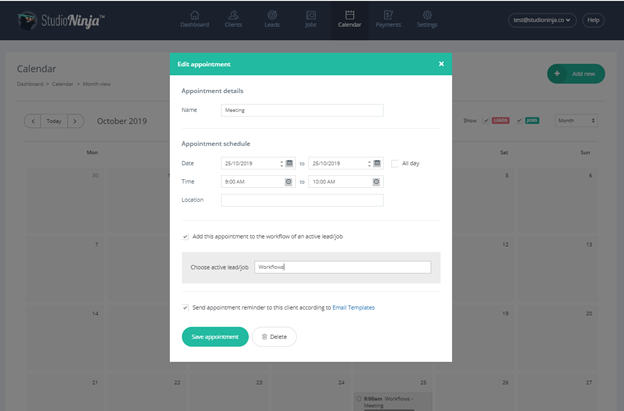 An appointment: is basically a task to schedule an appointment which appears on your calendar that sends an auto-reminder, if ticked, to your clients. Complete the task name and click 'Save workflow task'. Tick the box 'This task has a due date' and this tasks will be flagged with a red ! when overdue. Add the due date for the task and then click 'Save workflow task'. 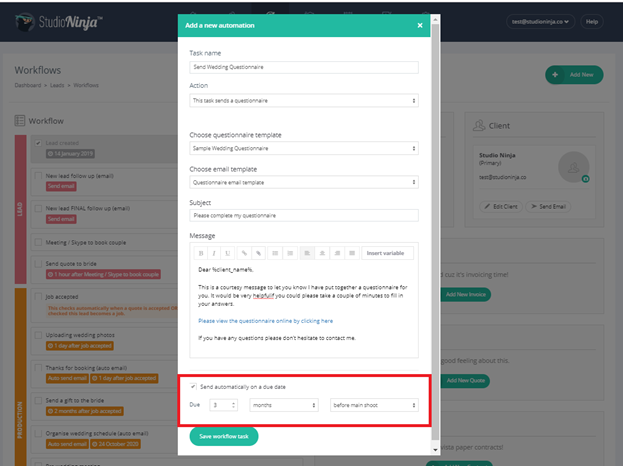 You can assign an email, questionnaire or contract template to an automation task. This email will automatically send to your client on the due date or when you tick this task in your workflow. Choose the type of action you want the system to do and the templates that will be used for the task. Click the 'Save workflow task'. Below you can see that we have created a task called 'Send Wedding Questionnaire' and selected the corresponding email template. We haven't added a due date to this automation, so to send this questionnaire all I need to do is tick the task in the workflow and the questionnaire will send. Tick the box 'Send automatically on a due date' and choose the date you want the email/contract/questionnaire to go out. In the example below you can see that we are creating a task called: 'Send Wedding Questionnaire' and I want this task to automatically send a questionnaire to my client 3 months before the main shoot..
You can also drag 'n' drop, add, edit and remove workflow tasks from within each Job for additional customisation. There are two ways to add an extra shoot in your workflows. adding it within the job or in Workflows (Settings). via the Studio Ninja Calendar. Complete the task name and the schedule. 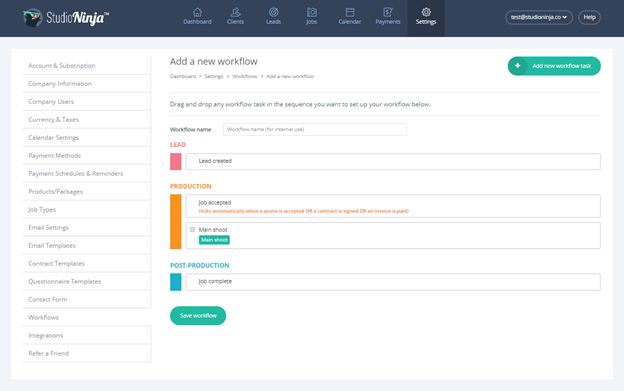 After saving the extra shoot task, the system will automatically insert the task within your workflows. 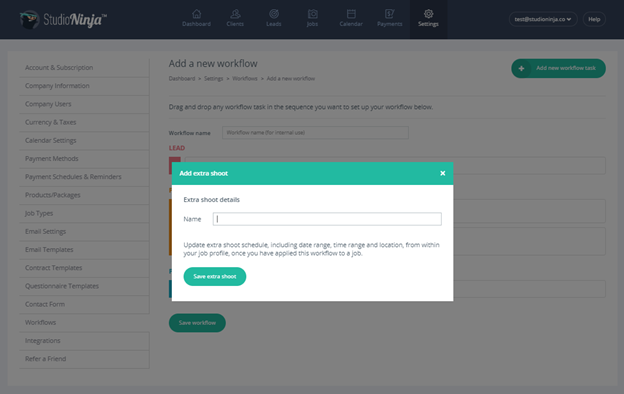 If you add an extra shoot in Workflows (Settings), You'll only have to complete the Task name and will have to update the schedule once the workflow has been assigned to a job. Click on the Calendar tab. Pick a date for the shoot. Complete the task name and schedule. 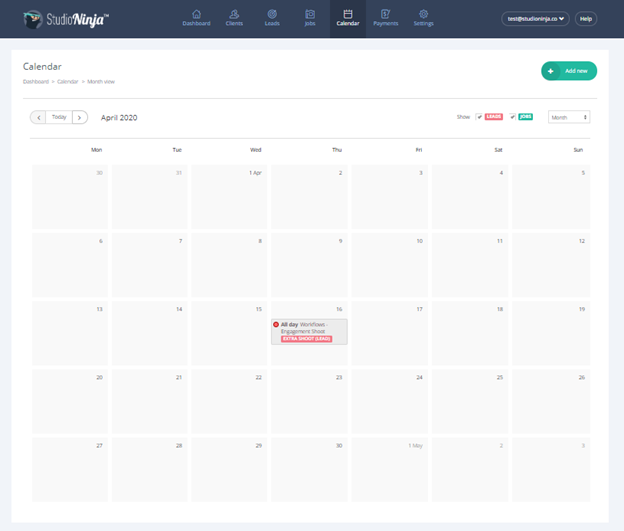 When adding via Studio Ninja Calendar, you will notice that the extra shoot date is automatically applied however you will have to choose an active job to add the task into the workflow. Just enter the name and choose from the drop dropdown list. Same with the extra shoot task, there are two ways to add an appointment in your workflows. adding it within the lead/job or in Workflows (Settings). Tick the ‘Send appointment reminder to this client according to Email Templates’ box if you want to automatically send a reminder. In the example below, I added a new appointment named ‘Meeting’ and scheduled it on Oct. 25th at 9am – 10am. I have ticked the ‘Send appointment reminder…..’ box to automatically send a reminder to my client according to how I’ve set it up in Email Templates (Settings). 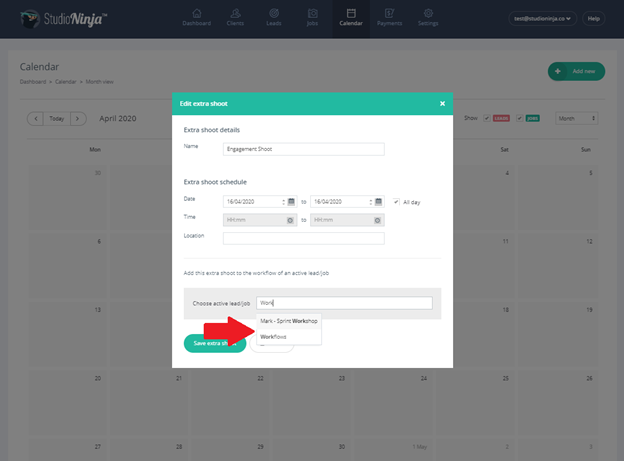 After saving the appointment, the system will automatically insert the task according to the date. Adding an appointment task in Workflows (Settings) is different, you'll only have to complete the Task name and will have to update the schedule once the workflow has been assigned to a job. Pick a date for the appointment. 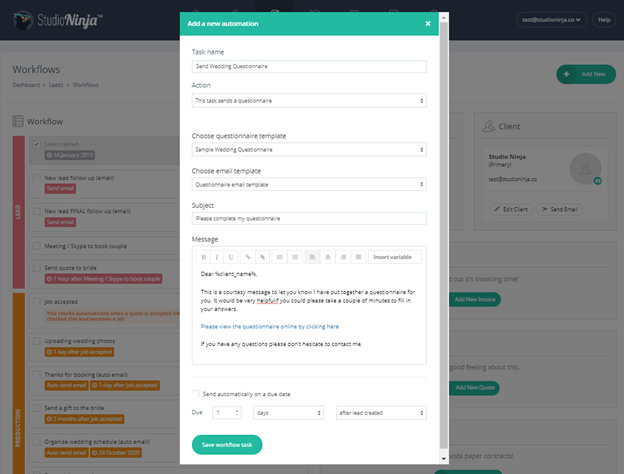 Tick the ‘Add this appointment to the workflow of an active lead/job’ if you want to assign it to a job. 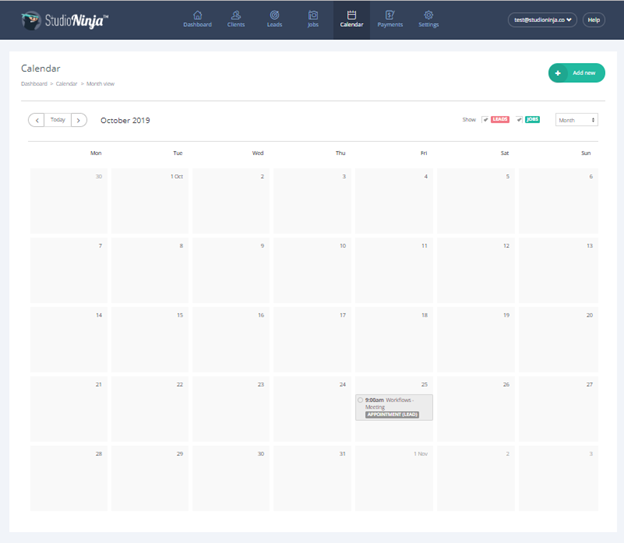 When adding via Studio Ninja Calendar, you will notice that the appointment date is automatically applied and will have to the option to assign it to an active job. To add the task to a job, just enter the name and choose from the drop dropdown list. You will easily notice the appointment task in your Calendar as it is the only entry that is labeled grey. Jobs are marked green and Leads are pink. Note: Don't forget to click on the Save Workflow button! 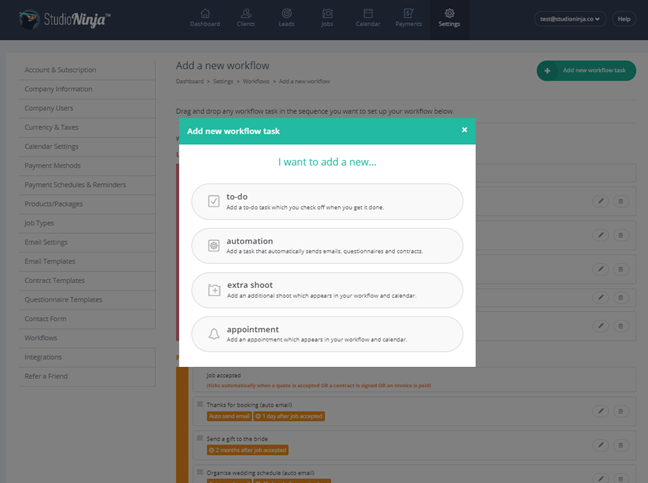 The workflow doesn't automatically save when you add new workflow tasks. Now it's your turn to start creating workflows. 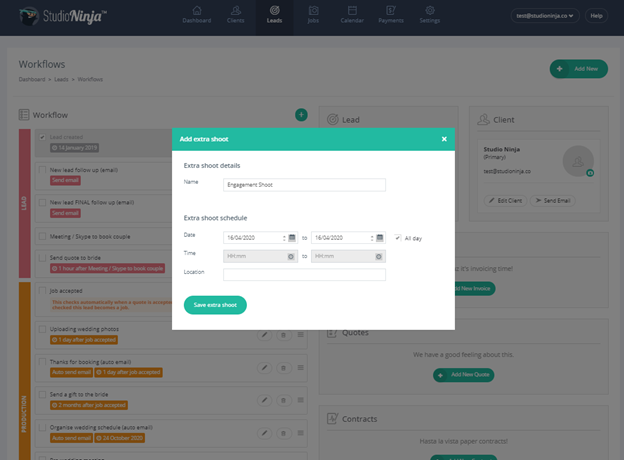 Make them as simple or as complicated as you like as we have designed our workflows to be more flexible, easier to setup and have more functionality. Remember, we are always trying to keep things simple. The goal of Studio Ninja is to simplify your admin, so if you find yourself sending the same email over and over again to every client, try and create an email template of this email and assign it to a workflow task with a due date.